Upon entering the church a visitor can see the two large icons of Christ and Our Lady displayed on the icon screen, and behind the altar table there is also a large painting of Christ the King enthroned. They do not appear to be as new as the church that hosts them. Their history and connection to Belarusian mission is narrated below. One of the first activities of the newly established Society of St John Chrysostom in 1926 was the organisation of an Eastern Liturgical Week of special prayer and study, which ended with the celebration of the Holy Liturgy according to the Byzantine Slavonic rite in Westminster Cathedral on Saturday, the 30th October 1926 in the presence of the late Cardinal Bourne, Archbishop of Westminster, and Bishop Michael d’Herbigny, S.J., the then Rector of the Oriental Institute in Rome, and the representative of the Apostolic See of Rome on this occasion. The actual liturgical solemnity at the occasion was the new Sunday of Christ the King established by Pope Pius XI in 1925. To reflect this the Roman Catholic Westminster Cathedral near Victoria station was adorned temporarily with an iconostasis, the iconography of which reflects the idea of Divine kingship. As it was stated in the article from “The Times” magazine, “this is in the form of a medieval iconostasis in the style of the Novgorod-Kieff period, which has been designed from material in the British Museum.” It was painted in oil on canvas by Mr Eric Ward and Countess Olga Bennigsen. Mr Eric Ward, shown on the newspaper cutting of the time, and whose signature bears the centrepiece could be the younger son of William George Ward, theologian and mathematician or the son of Wilfrid Philip Ward and thus a brother of the writer and publisher Maisie Ward, prominent English Catholic converts. 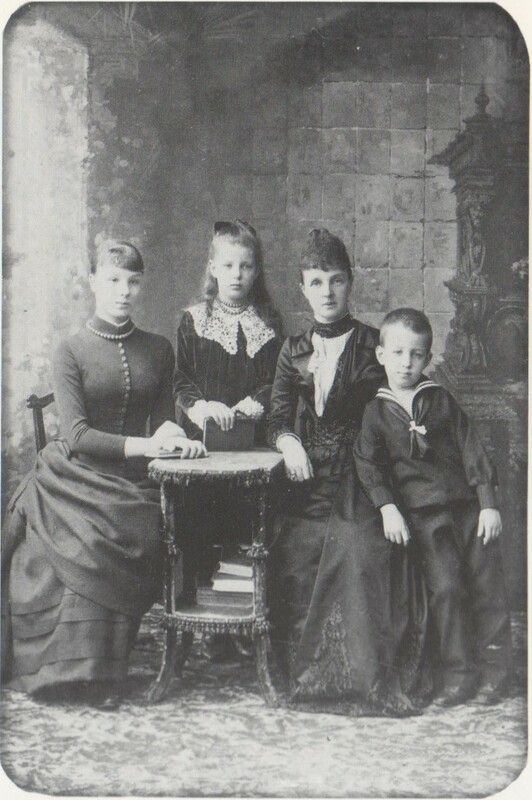 Future Countess Olga Vasilyevna Bennigsen (nee Skaryatina) (1879-1947) is shown here as a young woman with her mother and siblings in 1900 (left). She became a spouse to the renowned Russian Catholic émigré thinker, activist and magazine editor, Count George (Georgij Pavlovich) Bennigsen (1879-1962) in 1901. They lived in London at the time of the establishment of the White-Ruthenian (Belarusian) mission of the Byzantine Rite and the Count is known to have been parishioner of St Peter and Paul church at the Marian House before his departure to USA where he died in 1962. Countess Olga was buried at renowned Highgate cemetery in London on 22 December 1947. Count Bennigsen’s archive related to his activities as a secretary of the relief committee that helped Russian refugees and provided aid to the people in Soviet Russia during the famine of the 20-s is currently kept at the Skaryna Library. The aims of the Society of St John Chrysostom were “to make known to Western Christians the history, worship and spirituality of Eastern Christendom, and to work and pray that all men, and in particular the separated Eastern Christians, may speedily be united in One Church of Christ”. It was founded in 1926, apparently not without help of Bishop d’Herbigny, but ceased its activities after the outbreak of the war in 1939. Father Sipovich started thinking about reviving it as early as 1948 but did not succeed until 1959. He was helped in this by Hellen Georgiades, a Greek who before becoming a Catholic, had been secretary of a joint Anglican-Orthodox organisation called the Society of Saint Alban and Saint Sergius. The President of the Saint John Chrysostom Society was the Archbishop of Westminster. Father Sipovich was the secretary (after his elevation to the bishopric he became the Honorary Vice President) and Miss Georgiades – editor of the newly launched journal Chrysostom. In the years that followed the Society did much to spread knowledge about the Eastern Christian tradition among English speaking Catholics. It also became the champion of the cause of Eastern Catholics whom some “Latins” in the name of wrongly understood ecumenism considered an obstacle to “ecumenical contacts” with the Orthodox. Thus various parts of the dismantled iconostasis came into possession of Fr Ceslaus, and he displayed them on the walls of the old chapel at the Marian House, which can be seen on historic photographs. 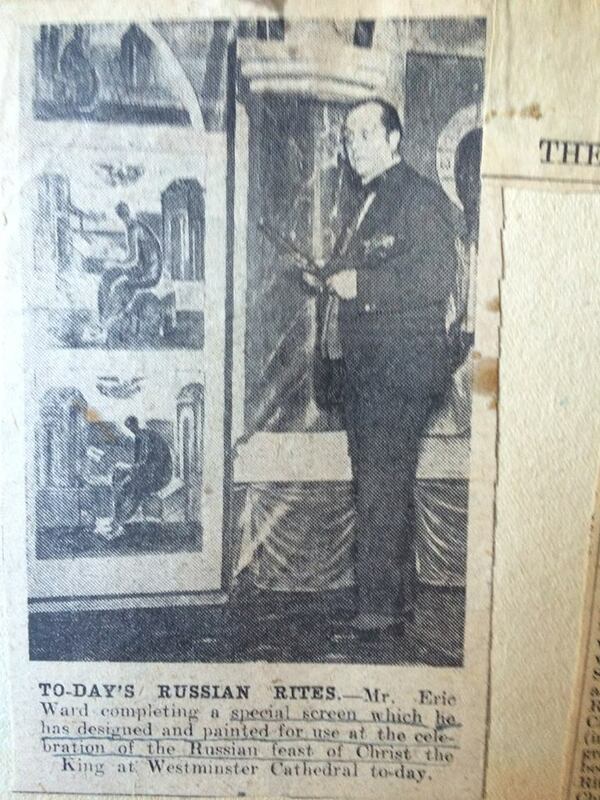 With the commission of the new iconostasis in 1957 they were presumably taken down and kept in storage ever since. Later, only the two large icons of Christ the Teacher and Our Lady were regularly displayed at the liturgies, which Father and later Bishop Sipovich celebrated elsewhere, especially in Latin churches. They were discovered in the attic of the house belonging to the Mission wrapped in brown paper and having MDF backing, which facilitated their better state of preservation. It is our hope that these works of sacred art and pieces of history of the Eastern Catholic churches in England will one day adorn the walls of our newly constructed church in their entirety, and it depends on generosity of our benefactors. The central piece adorning today the altar wall – the Deisis of Christ the King in glory surrounded by the heavenly powers as well as the two medallions of St Peter and St Paul have been restored by local restorers – The Picture Factory, North Finchley. The pair of the saints representing the patron saints of the authors and the Society – St John Chrysostom and St Olga, the Princess, were restored by the Kerat Studio in Wervik, Belgium, with financial support from the Society of St John Chrysostom. The restored icons were sanctified by the Ukrainian Bishop of Chicago Kyr Venedykt Aleksiychuk, former hegumen of the Studite monastery in Polatsak, Belarus during his visit to the church on 20 April 2017. Please contact us if you wish to support further restoration work.